Circus Circus: infamous among locals for being old and overrun with unsupervised kids. But Las Vegas locals are spoiled, spoiled, spoiled with hotels. A hotel that in any other part of the country would be considered a pleasant, affordable stay is considered an eyesore here. So visitors, bring the kids, and eat and sleep for cheap. Just be ready to forgive some wear and tear in the building. The Circus Circus Hotel and Casino offers a variety of choices in accommodations. Over 3,700 rooms provide the fun and benefits you would expect from a full-service Las Vegas hotel, along with the thrills of a 24 hour Las Vegas casino. All Circus Circus rooms include wireless internet availability, cable TV and pay-per-view channels, iron with ironing board, and hair dryer. Three towers are available to choose from at Circus Circus: the Skyrise Tower, the West Tower, and the Casino Tower. All offer rooms that are simple and spacious. Another 800 rooms await in five, three story buildings located across Circus Circus Drive in The Manor. Known as Manor Rooms, they provide comfort along with convenient self-parking, refrigerators, and a pool. Circus Circus is also the only place on the Las Vegas strip with an RV Park, for those taking their families on a vision quest. Circus Circus Las Vegas Hotel & Casino offers unique amenities the entire family can enjoy. 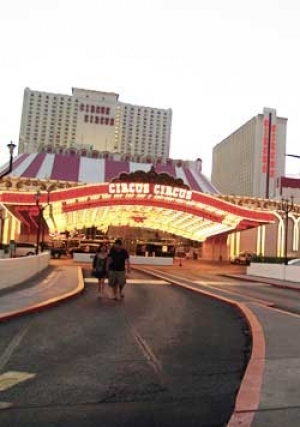 Circus Circus Hotel offers low room rates and the only RV Park on the Las Vegas Strip. While staying at Circus Circus Las Vegas, adults can enjoy gaming in any of three Las Vegas casinos, while kids can entertain themselves in Circus Circus Hotel and Casino Carnival Midway. Circus Circus Las Vegas Adventuredome Theme Park offers excitement for the entire family. There are plenty of food choices at Circus Circus. The Steak House is home to the best steak in Vegas for several years running, according to the Las Vegas Review-Journal. If you are in the mood for something Mexican, then slide into Mexitalia X-Press, where you will find mouth watering Italian dishes as well. The Garden Grill offers a variety of foods including steaks, seafood, pasta, and sandwiches. For an even greater variety of culinary delights, check out the Circus Buffet, one of the larger buffets on the Strip. Other choices include the Pizzeria, Westside Deli, and Barista Bagels and More. Adventuredome at Circus Circus Las Vegas is a 5-acre elevated theme park located behind the West Tower. Rides include Canyon Blaster, a roller coaster with the world's largest indoor double-loop and double-corkscrew; Rim Runner, a wet and wild water ride; Sling Shot, a new tower ride that shoots you up with 4 G's of acceleration; Inverter, a flipping-ride that gives riders 360 degrees of constant G-force; plus childrens rides, as well as plenty of attractions for the entire family. The famous Carnival Midway at Circus Circus Hotel & Casino will thrill kids and adults of all ages! The Midway contains games where you can win prizes while watching circus acts performed center stage. The Midway also features an arcade with 200 of todays popular games and yesterday's classics. Weddings at Circus Circus Hotel offer a wedding chapel and reception space for banquets. Professional staff at Circus Circus Las Vegas are equipped to host and cater your event and provide options like live entertainment and menu packages. Circus Circus Hotel & Casino Convention Center offers 21,400 sq ft of flexible meeting and convention facilities to host events of up to 600 guests. Circus Circus Casino in Las Vegas offers three casino floors that total 100,000 sq ft of open gaming area. Circus Circus Casino features slots, table games, Poker Room, and Race & Sports Book.